Click the orange section to learn more about the Germantown 2009 Employment Area. 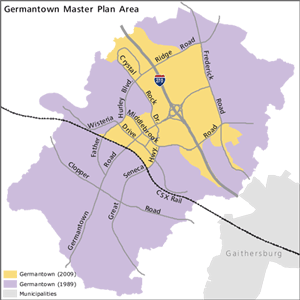 2009 Germantown Employment Area Sector Plan (see map). Please refer to the Sector Plan for the approximately 2,400-acre area around I-270 and the future Corridor Cities Transit Stations, and to this master plan for the balance of Germantown. See the MARC Rail Communities Plan for changes planned near the train station. The Germantown Plan for the Town Sector Zone is underway and will update the town sector zoning for Churchill Village.